The research shows that under eating can have a couple negative effects. Firstly, it can slow your metabolism, because your body thinks it has to survive on less. Secondly, it can actually increase your cortisol - a stress hormone. Increased cortisol actually has a direct connection with weight GAIN, so not ideal! In my experience and with my clients, restriction does not work in the long term. Unless you have super-human will power, which maybe 1% of you do, you actually may end up worse off after being very restrictive, by binging or resorting to your old habits very soon after. There are a number of different herbs and teas that can help support your liver’s natural detoxification process. The only issue with just using these herbs is that supplements are truly supplemental. Without removing the foods that are difficult on your liver, you aren’t treating the root cause. What works the best is to make this more of a lifestyle, and crowd out ‘the bad with the good’ and make cleansing & detoxing part of your every day. Aiming for 6-8 servings of vegetables every single day. Using natural detox foods - like these 7 Natural Detox Foods daily - particularly lemon! Removing sugar, even the more natural sugars like maple syrup and honey. If you would like a FREE one week meal plan to help you eat this way daily, scroll down to the blue banner at the bottom of this post that says, “Eat Better. Feel Amazing” and grab it now! One thing I really like to do on a daily basis is include the Genuine Health Vegan Greens+ O either in my smoothie or in water. It’s a greens powder that has organic spirulina, broccoli sprouts, carrot root, apple peel, alfalfa grass, beet root, chia seeds, sunflower lecithin and so much more. It’s also got milk thistle seed extract, which is a fantastic liver loving herb. 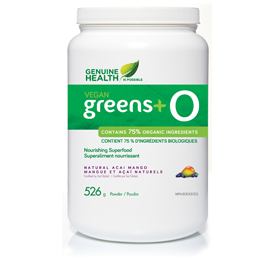 Don't forget for those of you are gluten free, the Greens+ O is the type you want. The other greens plus powders by Genuine Health are not gluten free. It does take some work though, and won’t happen overnight. Healthy eating is a lifestyle, and you have to stick with it to get results. *This post was sponsored by Genuine Health, but all thoughts and opinions are my own.